There is no doubt about the truth that the paintings of Neela Pushparaj heal. I recently visited Jadite Galleries on an oppressively hot day, the blazing sun baking the gritty Manhattan streets while people jostled each other as they dashed about. My soul was assaulted by all of it until I entered the gallery, a space filled with tranquil floral watercolor jewels painted by this artist. The harsh air outside melted into soothing coolness of reifications of nature’s grandeur, the happy color strokes of gorgeous blooms quickly calming my savage self. Pushparaj was trained as an M.D. in medical pathology. Working in hospitals throughout most of her professional life, she was well-acquainted with patients’ sufferings and displayed her paintings in these facilities, the pictures always bringing happiness to critically ill people. The first time she exhibited her work was at the Morristown Medical Center in New Jersey, then branching out to St. Francis Hospital in Poughkeepsie, NY, where she started the first gallery within the hospital. Her early years, spent with a loving family in India, cultivated her healing heart which manifests itself in the deep beauty of her paintings, expressing her soul’s largesse. 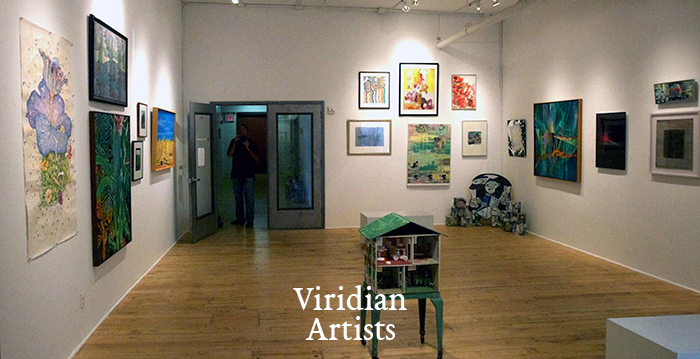 This generosity is evident throughout her oeuvre and happily Jadite Galleries was able to showcase her range of artistic accomplishments on its premises. Beginning to paint at age 49, Pushparaj quickly learned her craft from a variety of teachers, particularly the painter, Barbara Nechis, who showed her how to handle the white of the watercolor page, the imagery, results of the application of water paint in positive and negative spaces. 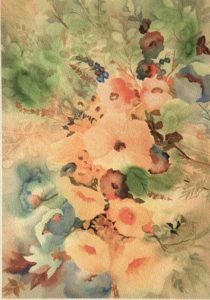 Her watercolors in the beginning of her new artistic life, more tightly rendered than her more previous works, show a new sense of freedom. Her paintings are naturally intuitive, flowers springing up spontaneously on the page from her brush without preliminary sketching or planning. The compositions develop based on the artist’s instincts and the results are remarkable. She cannot explain her process because her images come from deep within, molding free form tinted water splotches into beautiful blooms. Her method is so unique that a video of her act of painting was made to demonstrate her miraculous technique where there is no possibility of step-by-step academic explanation. A wonderful early piece, “Roses and Apples,” foretells the new freedom of her more recent works where detailed white daisies anchor the more fluid flowers and fruit in the composition—the daisies shyly peaking out amid pale apples and yellow tinted roses while juxtaposing more tightly rendered blooms with the more loosely handled areas and bringing a natural dramatic tension to the piece. Her distinctive composition, “Bouquet with Red Leaves,” does the same, again, contrasting detailed florals with flowing forms of complimentary red and green leaves, giving the painting an expansive vigor, appealing deeply to me. The artist successfully brings a trompe l’oeil device to her two experimental pieces, “The Joy of Flowers” and “The Joy of Flowers, II.” Both are of blossoms painted in water media on canvas so that they appear to be rendered on paper superimposed on green acrylic background. In actuality, the paintings are one painted surface, each, combinations of the water media bright floral details, with surrounding acrylic flat borders, so that one thinks the paper has been attached to the canvases, rather than being results of the successful assignment of only one canvas for each piece without separate paper adhered to the green surfaces. Her painting, “Love is in the Air,” of yellow flowers on paper in its loose handling of the subject matter, anticipates her newer works on clay boards, “Pretty Posy I & II,” where masterful use of oranges and other warms in the petals creates sensuous bright areas with white surfaces peeking through to model the blooms. The flowers seem to meld lusciously into the boards in grand depictions of beauty, causing me an ecstatic response. Another piece, entitled “Harmony,” finished at a residency with Basha Maryanska, also displays the artist’s newly sensed freedom. Here, swaths of green leaves take a searching path upwards while intimations of blue-green blooms on the canvas give the painting a magnificent vertical sweep bringing me joy in reaction to the movement. One of the newest pieces, the beautiful “Carnival,” shares an affinity with a previous work, “Nature’s Way,” the quick dashes of saturated color strokes flying across the surface, thus reminding me of Henri-Edmond Cross’s watercolor, “Rocks at Trayas,” in its gorgeous masterful handling of warms and cools dancing on the paper. Finally, as a lovely crown to the show, “Sakura,” a depiction of abundant cherry blossoms heralding the Japanese Spring, filled me with great delight—the beautiful flowers painted in full clusters of pinks, greens and white on the picture’s surface, the flowers’ fragrance almost palpable. These thirty paintings elevated me to a higher realm, separating me from the claustrophobic city clatter outside the gallery. I did not want to leave Jadite to face the disjointedness on the periphery of this oasis. For a few hours, I was healed by Neela Pushparaj, M.D., a doctor of souls, rejuvenating me through a vacation of freedom, joy and beauty, so that I could return to New York City’s sizzling chaos, well fortified, refreshed and rested.